This last weekend I attended the 2014 Western Hunting and Conservation Expo! This was the first time I have ever been to an outdoor expo and man it was an eye opener for me! With it being Valentines weekend I had my wife with me for the weekend and the way she described it was, "It's like a glamorized craft fair for men" haha I couldn't agree more! If you haven't been to an outdoor expo you need to and this post will tell you all of the reasons I would suggest you go! My number one reason for going would hands down be all about meeting the people behind the scenes. As much as many of us outdoors men would love to work in the hunting industry I give extreme kudos to those who make the sacrifices during the on and off season to make sure the hunters who don't work in the industry are able to enjoy our hunting experience. 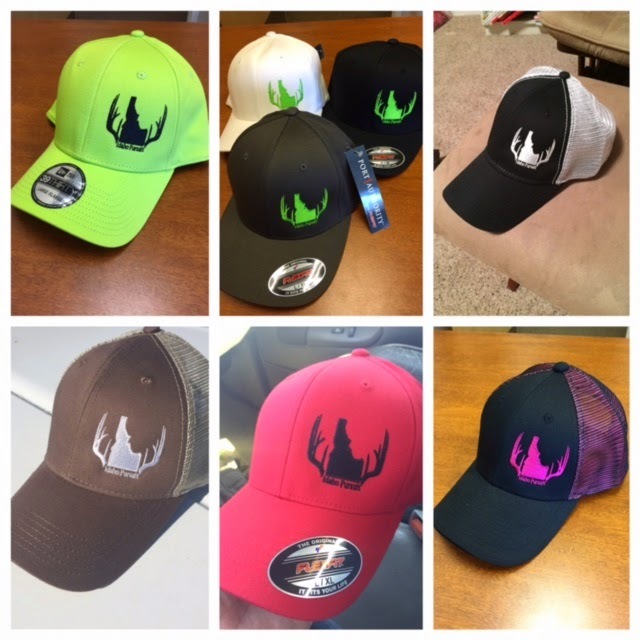 These guys at the booths are passionate about the sport of hunting but rather than spending their time in the woods like many of us, they spend their time designing new products to make our hunting experience better. Every booth my wife and I went to, we were met by amazing people who were genuinely interested in helping us find what we were looking for at the expo! One of the booths I spent well over an hour at was the Hawke Sports Optics booth talking to Trent about the different products. After talking about scopes and binoculars we both started talking about our families, hunting experiences, pet-peeves, and anything else that we could think about. I'm just speaking from my point of view but when a person is willing to spend that type of time talking to you about anything and everything, that's the type of person I want to do business with! Not to mention the price on their products were hands down the best deal in the whole expo for optics! I spent a good portion of the day showing my wife the different optics at the expo, comparing quality and price... Quoting her again, "Why would anyone buy one of those other expensive optics just to have some fancy name on it!" I tried to help my wife understand that those big brand names are similar to those in vehicles, clothing, shoes, etc. and you are buying the name more than anything... Back to the expo! Another booth I spent a lot of time at was the 46 Rail booth! I am completely honest with you when I say that this booth was so good I literally took my clothes off... (in a dressing room of course!) I had seen this brand of camo on Twitter and other social media outlets and was VERY curious about them. They have a completely different design that no other camo company has even come close to as well as a very unique fit. I won't lie the first time I saw these I thought they were weird and you couldn't pay me enough to be seen wearing them around. When I showed up at the booth and saw them in real life I was a lot more open minded about them.... Then I tried them on.... WOW! Honestly I have never tried on a more comfortable pair of pants (let a lone camo pants) ever in my life! The only way to describe them is that you don't even feel like you are wearing pants... I know that sounds a little odd but these pants were so comfortable I would choose to where them over my sweat pants at night if I could! 46Rail camo pants, shirt, gloves, and bino case! If I hadn't gone to the expo I don't think I would ever given 46 Rail another thought other than, "oh yeah those are the funny pants guys". Now that I have seen them in person, worn them around, and talk to the guys in the booth about their functionality... I will say that some day I am going to own me a pair of these pants! I could talk on and on about what I loved about the expo and I am sure I will be writing more about some of the products I saw there but I just want to leave you by saying if you haven't been to an expo like this or something similar to it, you need to go! These shows are places you can get amazing deals on amazing products as well as meet some outstanding people! The expo is also a great place where you can find out about products you have never heard of and be ahead of the game (literally in some cases) when it comes to being successful on your next hunt! As many of you know I have been using the JawJacker now for a few seasons and have become a believer of them. Even though I have been extremely happy with the performance of the JawJacker, in the back of my mind I have always wondered how they compared to the Automatic Fisherman. 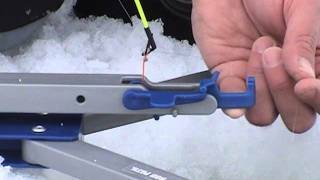 The Automatic Fisherman has been on the market since 2002 but has been in the work since the 70's and was sort of the Grandfather of the "hook-set" gadgets for ice fishing. I have talked to a lot of people who have used the Automatic Fisherman first and then tried the JawJacker but have not found anyone who has tried out both units by first being associated and familiar with the JawJacker.... So I decided I would give it a shot and this is how it went. With the Automatic Fisherman, the base is made of a high density plastic that is rated for -90 below which is pretty durable if you ask me. If you are fishing in weather colder than that your name must be Chuck Norris and you don't need any hook-set system; you could probably swim after the fish and they would surrender to you! The base is one solid piece excluding a support brace arm that tucks away neatly underneath when not in use and spreads out about 5 inches on each side preventing the unit from tipping over or being pulled into the hole by a hooked fish. The only other part of the Automatic fisherman that is a moving part is the trigger mechanism that I will discuss later. One thing that I was quickly uneasy with concerning my previous experience with the JawJacker was the size of Automatic Fisherman. Compared to the compact-ability of the JawJacker, the Automatic Fisherman is a lot more difficult to pack and transport. While at the same time, the benefit of the bulkiness is the fact that there are less moving parts, which means less parts that may break. Kerry who designed the Automatic Fisherman says that he has built and distributed over 60,000 of these and has only gotten one back because the customer was using it as a hammer to try and break the ice... The Automatic Fisherman is covered under a lifetime warranty for the base unit and trigger system. The website may be a little confusing about the warranty because they sell the base unit as well as many other accessories. If you have any questions about this please email or call Kerry off the website and he would be more than willing to help you out if possible. I have heard a lot of people talking concerning the JawJacker's durability in the cold but I have not had any problems myself with this at all. One of my fisher partners on the other hand failed to set up his JawJacker correctly which resulted in his rod holder adjustment breaking on him. He still uses his JawJacker but has had to find a unique way to set his adjustment pin. I am not sure what other abuse this JawJacker went through before it broke like this but I also know that the guy who this happened to has used this JawJacker for over two years now and when he is not using it just tosses it in a bucket with his ice-fishing rods to transport it to and from fishing. Another thing that was interesting to me about the Automatic Fisherman is the trigger mechanism. The triggers on the Automatic Fisherman is a metal bar that extends out of the front of the device. This metal bar has a metal pin which you hook the eye of your fishing rod onto which sets the tension and sensitivity of the trigger. The end of the metal rod is a "V" shaped guide which you put your line through to keep in on the trigger. Here is a close up picture of the trigger mechanism of the Automatic Fisherman. The sensitivity of the unit can be adjusted by simply bending the metal pin which you hook your rod on. The more you bend it toward the rod the stiffer the sensitivity. The more the pin is bent in the other direction, the more sensitive the trigger will be. I did not like how the trigger mechanism was metal just because I often got my hands wet while taking care of a fish and then my fingers would stick to the metal while trying to rest it. What I liked about the trigger mechanism of the Automatic Fisherman is that it is very simple. The one ting I picked up on that I don't know how much of a difference it makes is that when you set the trigger with the Automatic Fisherman, the rod tip is lower than the line at the top of the trigger arm. With the JawJacker, the rod tip is actually higher than the line when the line is placed in the "V" of the trigger. With this I noticed that even when I set the trigger to extremely sensitive on the JawJacker, there were times when the fish would just slightly bump the bait but the line would tighten without setting the trigger off. I don't know if this was in my head or if the angle of these trigger mechanisms were a factor in hook up ratios. I will say that but also say that I have caught some extremely small fish which were light biters on the JawJacker so I am not sure how much of a factor this was. I did a lot of research about these two units both from advocates of the Automatic Fisherman and advocates of the JawJacker and found that many of the reasoning behind using one unit over the other were quite common. This is what I found from some of the advocates. Bill: @BYOUNG460 [Instagram] - "The Automatic fisherman is a beefy and has a large profile, but can be cumbersome and take up more room to transport. The JawJacker is light weight and compact and can be easily packed away in the smallest of area." Brandon: @wip95 [Instagram] - "I give the Automatic Fisherman a 10/10! It is effective for catching everything from pike to light biting trout"
Rod: @Bass_Junky [Instagram] - "The Automatic Fisherman is made of a high density plastic and is rated for weather up to -90. It takes a beating on the ice and holds up to being dropped, kicked and knocked around inside you sled." Over all, I couldn't tell you one or the other would be better for you! I took the stance that I am comfortable with my JawJackers and thought I would be cheating myself if I didn't at least give the Automatic Fisherman a chance. Talking to many people about these devices I still haven't found one who has gone from using the JawJacker to the Automatic Fisherman. You can find plenty of happy customers of both devices as well as a hand full of unhappy customers. Bill (@BYOUNG460) said that he went from using the Automatic Fisherman to the JawJacker while at the same time he liked the Automatic Fisherman and its performance just preferred the one over the other. Rod (@Bass_Junky) used both devices and uses his Automatic Fisherman more because that is what he is comfortable with and has had lots of success with. In summary I would say that 1) The Automatic Fisherman is bigger and bulkier that the JawJacker and that the JawJacker is more compact and easier to store/transport. 2) The Automatic Fisherman is built TOUGH and has a life time warranty which is very nice when/if you need it! 3) The Automatic Fisherman trigger is set at a angle that prevents finicky fish to take your bait without setting off the trigger. 4) The Automatic Fisherman is more difficult to adjust trigger sensitivity while fishing. If you do not bring the tool they include to adjust the trigger you have to either bend it with your fingers or some other tool while the JawJacker is a simple adjustment screw you can adjust with your fingers. These four items are the things I noticed were different but when it came to performance I couldn't even tell a difference. Both devices caught fish and both devices missed a few also. I would say you can't go wrong with either device.